May's Closet Raid is underway, as the etsy shop is updated though Saturday (and some on Sunday). I truly LOVE this month's collection. Some of these pieces are so hard to part with - like this pale yellow floral maxi dress with a plunging back. It makes me forget that it's so chilly out this morning. Setting up a new collection for sale used to mean hanging it on a hanger...it was much easier then. Some of you who are new to Lune might not know that last fall, I closed up the local vintage clothing and home shop for Lune Vintage and moved into a studio downtown to change focus for a while and concentrate on teaching workshops and developing my own line of clothing and accessories, Love Lune. It was a good decision, and I don't regret it. So many amazing things have happened in this past 9 months that have refreshed Lune for me. Where I was feeling lost and feeling like Lune was just existing, now I feel that there is lasting potential and direction for it. 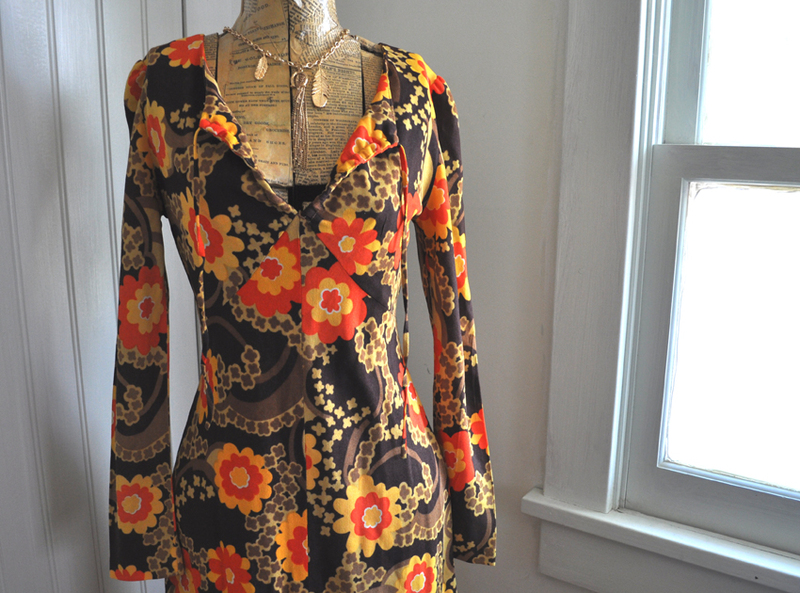 This Spring and Summer, Lune Vintage opens it's doors again, offering collections of high quality, bohemian 60's and 70's vintage apparel, alongside Love Lune designs! This time though, those doors will be on wheels, and traveling to where the action is in a 1976 Boler trailer! I can't think of a better way to enjoy the summer, and running shop while working on my tan at the same time. The best part about doing these Closet Raid's for the etsy shop is the chance to be very selective (not so easy when you're trying to keep an entire shop stocked with merch). I truly appreciate each item, take the time to style it, and make it fully wearable. Whether this means simply shorting hemlines, or fully dyeing and reconstructing an item, it means that I've exercised Lune's aesthetic. That has been so valuable. In this way, the extra effort it takes to offer vintage clothing online continues to be worthwhile. I hope you enjoy May's Closet Raid as much as I have curating it! Love Lune, Spring/Summer line editorial and Preview of new products! Thank you for reading and being my blog friends!